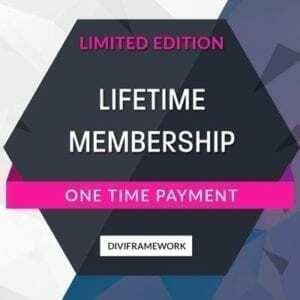 Lifetime Access to Divi Framework - only $89! Be a proficient Divi web designer for life! Divi Framework Lifetime Access (the ultimate “power membership”) gives you access to all current and future releases of plugins, child themes and learning courses created by us for use with the Divi WordPress Theme by Elegant Themes. We all know the Divi theme is a great tool to build web sites. Divi is the #1 most popular WordPress theme in the world! Divi’s “page builder” (both back end and front end) is easy to use and intuitive. Additionally, the “Theme Customizer” settings and the “Theme Options” settings (what used to be known as the ePanel back in the day) allow you to customize the design of your site very easily. Plus, the official Divi Layout Packs library is growing every week with new additions! Having an Elegant Themes subscription equips you with the basics you need to build some great websites in no time. This all sounds good for a normal DIYer who needs to build a simple website! But… you run a Divi-based web design business. You want tools and resources to provide more value to your clients, while saving you time. Maybe you want to offer SEO services to your Divi web-design package, you might want to sell child themes for Divi, or maybe you have a client who runs a restaurant and you need to deliver suitable design and features. You need an all-in-one “power membership” that provide solutions to Divi problems, while teaching you how to make more money with your web design business. You don’t want great websites, you want AWESOME websites! Let us introduce you to… Divi Framework! Divi Framework is a project started by Divi web designer, SEO and WordPress guru Matt Knighton. It is a resource center built by a web designer, for web designers. It provides powerful add-on solutions for the Divi theme, along with training courses that will enable you to further enhance your web design skills. Check out the YouTube channel and make the most of the FREE offerings. Videos are the next big thing in internet marketing, so it’s handy to have a module designed specifically for that purpose when using the Divi Builder. This plugin enables you to upload and manage video content on your websites effortlessly. Plus, you can create your own video libraries and even customize the Video player. The Instagram Feed Divi Module appeals to those who want to get the most out of this super popular social network. Once installed, it allows you to customize your Instagram feed and enhance your website’s visual appeal. With the Divi Testimonials Plugin, you can integrate customer feedback into your site. This handy tool allows you to manage, customize, and categorize testimonials in a single place. It is imperative that any site selling a product or service should have strong, motivating testimonials. With the Restaurant Menu Plugin, your restaurant menu will look professional and unique, with multiple pricing options, different currency symbols, and custom features. This tool isn’t just for restaurants. It’s also a great choice for cafes, smoothie bars, cocktail bars, and other venues. You’ll love its styling options and one-of-a-kind menu layouts! It also has recently added Schema support which is awesome for your Divi SEO. The Divi Breadcrumb Module is for those who want a really clean header with breadcrumbs in it. Breadcrumbs are another very important aspect of great SEO. Create and manage business locations like stores, offices, partners, stockists etc. on a separate post type and display and geo-search those locations on Google Maps using a custom Divi Module. Pre-defined styles available for Google Maps. The VR View Divi Module allows you to embed 360 degree photos using Google’s WebVR. Wow! Map a Divi Library item to a WordPress Single Page template for a public post type. The Divi Library item post content will be rendered for the post type’s single page. The FAQ plugin allows you to place FAQ listings in multiple locations, filtered by categories. Any good restaurant website will have the combination of beautifully designed pages, a menu management tool, customer testimonials and the ability to take reservations. This and much more are covered with this Divi Child Theme made especially for restaurants. This child theme is a great combination of elegant typography, simple styles and no complicated CSS! You also get access to an expansive library of current and upcoming WordPress/Divi training courses. Learn more about Matt, your instructor. In this course, Matt explains some of the basics of SEO and how to do it right in your Divi website. If you have ever wanted to make your own child themes then this is the course for you. Learn how to package a Divi child theme for resale. You absolutely can’t beat passive income! In this course, Matt shows you how to authenticate and pull data from your WooCommerce website into a Google Sheet. All products are well documented and supported. Additionally, the road map regarding “what’s coming” is well explained in ‘The Year Ahead‘ blog post. As you can see from that, they deliver what’s promised! The normal price of lifetime membership is only $747 USD. But, with this special deal (and for a very limited time! ), you can grab that membership for an astonishingly low $89… That’s a massive 88% discount from the normal price! This is one of the best investments you can make for your Divi web design business. So, grab your lifetime membership and be one of the lucky 100! The all-in-one membership designed to make you a Divi power user!